Blurb: Incarnate raised a lot of brilliant questions, and Asunder rose to the challenge. Buckle up. These answers will blow you away. Review: Woah. I'll keep this short to avoid being spoilery. But woah. I LOVED Incarnate and I was amazed at how Jodi was able to weave together so many (seemingly) unconnected plot elements. Asunder takes that weave and makes you step back to see the whole tapestry. Yup. That's right. This book deserves an analogy. There were literally some moments where I gasped aloud. I will admit that the first bit went a little slow, but that was okay with me because we were meeting new people. The "slow"-ness made me feel like I was really connecting with them. And there's no sequel-phase! Hurrah! I would still classify this as a "bridge-book" as it wasn't as action-packed as the first, and I can tell the third will have a lot more action. But it's probably the best bridge-book I've read in a long time. I loved this book so much! That's a great analogy, because that's exactly what it seemed like to me. Everything finally starts to come together and you're beginning to realize just how big everything is. 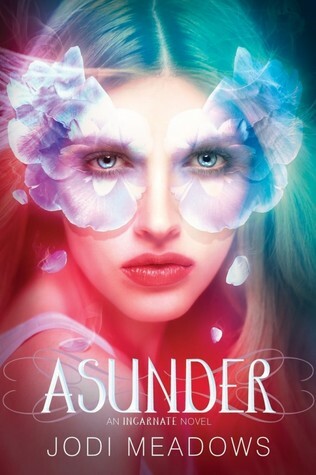 I think in the end that's what made me like Asunder even more than Incarnate. And now I'm dying for Book #3! NO! Do NOT just start with book 2. You will have NO IDEA what's going on.